It’s a little known fact that dolls houses were in existence in Egypt over 5,000 years ago. These early examples were true miniature homes, made out of wood, with miniature furnishings, servants and livestock. However these ancient Egyptian dolls houses were not toys as we know them today. Discovered in Egyptian tombs it is thought that these models were used for religious purposes. It wasn’t until the 16th century that dolls houses began to be used for amusement, but not for children. These were used by wealthy adults who would commission specialist craftsmen to painstakingly create ornately decorated and furnished dolls houses, or ‘baby houses’ as they were called at the time. Dolls houses evolved to become learning aids for young girls being taught domestic skills the function of various aspects of a household. By the mid 19th century dolls houses were immensely popular, much more affordable and every little girl wanted one, if they didn’t already own one. Today, dolls houses are as popular as ever with both collectors and children, boys and girls. There are many specialist suppliers of often expensive dolls house miniatures, clearly aimed at the ardent collector. Many of these enthusiasts will have fond memories of their first dolls house from their childhood. Here at Mulberry Bush we have some outstanding dolls houses, furniture and dolls that are all beautifully made and superb quality. Dolls houses are excellent learning toys, helping children to develop social skills and make sense of the world around them. 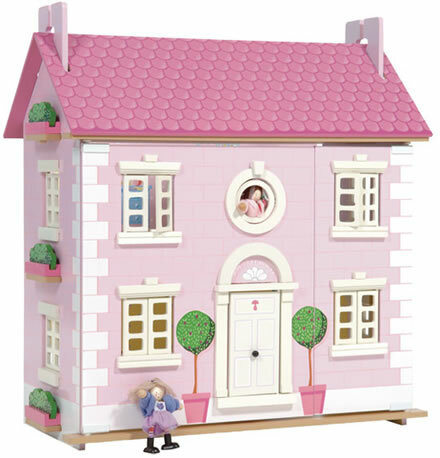 They also provide a fantastic way to interact with your children by decorating and furnishing their dolls house together. If you are wracking your brains for that special Christmas gift then a dolls house could be just what you are looking for.